Edgewear effects. Each Gizmo has useful parameters exposed on its Node to quickly adjust core settings. Gizmos will not be automatically installed with MARI Extension Pack 3 R2. You can find the Gizmos as part of the MARI Extension Pack 3 R2 Preset ZIP File you downloaded on purchase. If the subfolder GIZMOS does not exist on your machine, you might have to create it yourself. 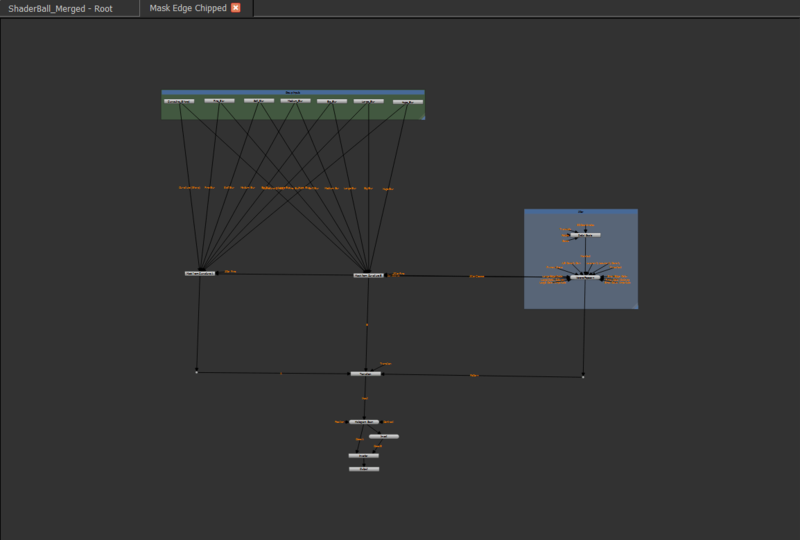 Mari will load any file found as a single node you can create via the Nodegraph / Right Mouse Click / Add Nodes Menu. In order to place a node in a submenu structure, place the Nodes in any Subfolder within a GIZMOS load directory. 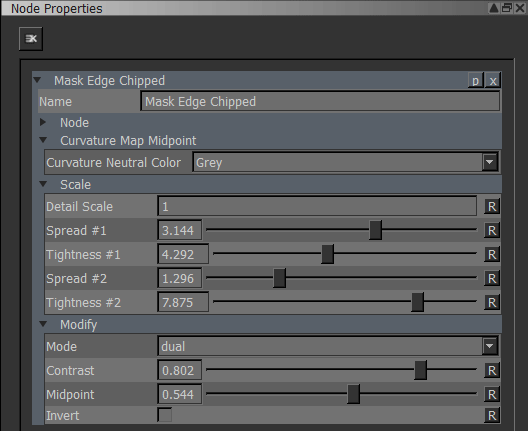 via the Nodegraph Right Mouse Button Menu / Add Nodes / Mask Presets / submenu. .. resulting in a Node being added to your Graph. the group to see the internal wiring of the node. at the top of the Nodegraph. The Internal Wiring of the Preset after double clicking on it. Nodeproperties to facilitate quick changes without the need to go digging through the internal workings of the Preset. You can get to the exposed Attributes via the Node properties Palette. The exposed Attributes of the Preset seen via the Node Properties Palette. Most MARI Extension Pack 3 R2 Edge Wear Presets require a set of input maps to work properly. brought in from an external baking solution such as XNormal, MightyBake or similar. single Curvature Map and an Ambient Occlusion Map. 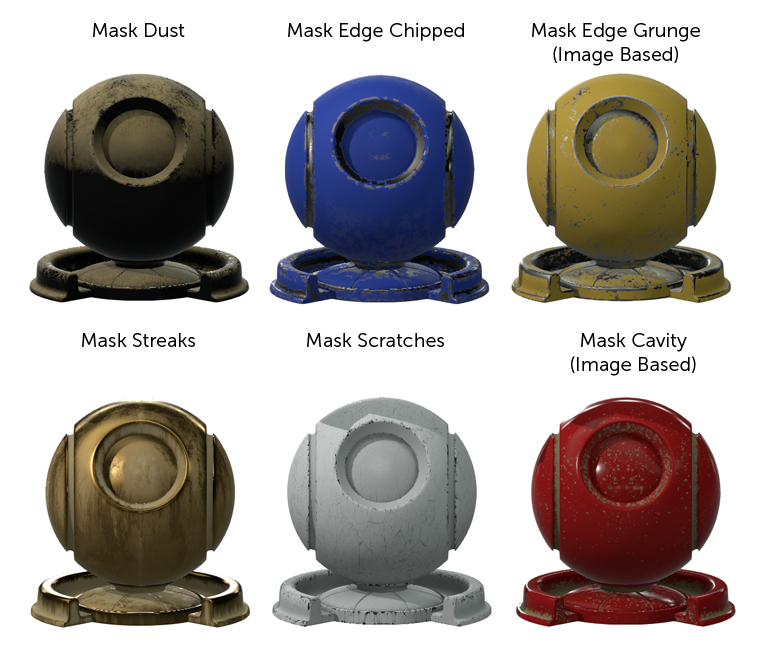 Most Curvature based effects in MARI Extension Pack 3 R2 Edge Wear Presets utilize the Mask from Curvature Node. The Node is an Image Processing Node designed to blend together different blurred Versions of a single Curvature Map. of your curvature map either in Mari or in external programs such as Nuke or Photoshop. 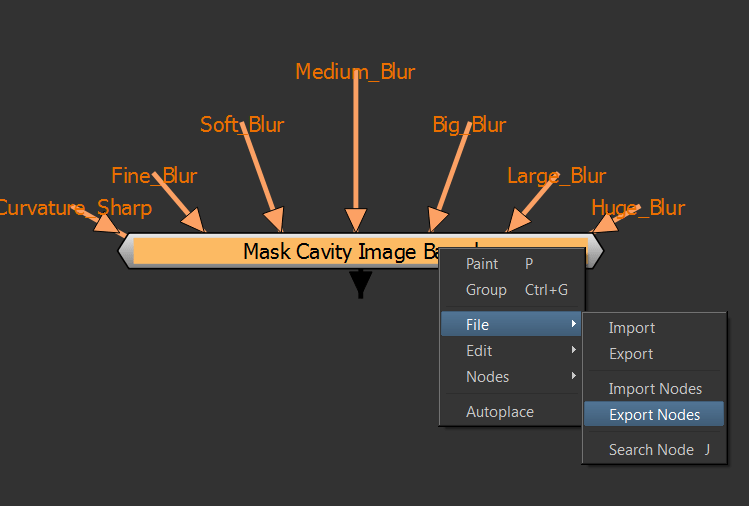 For an in-depth step-by-step please refer to the Step-by-Step Setup of the Mask from Curvature Node. Some Edge Wear Presets labeled 'Image Based require an Input Map to be added via the Node Properties Palette. 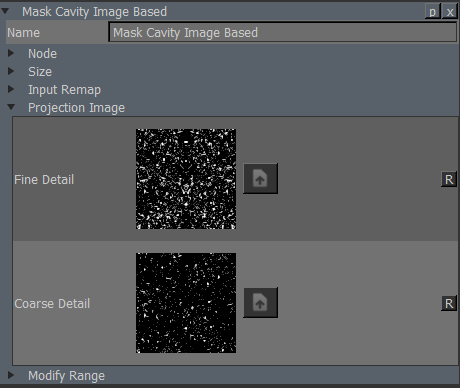 These Input Maps can be any grunge map of your choosing, resulting in different looks to the preset. Maybe you changed a preset, modified some settings and wish to keep it as a separate preset for future use ? 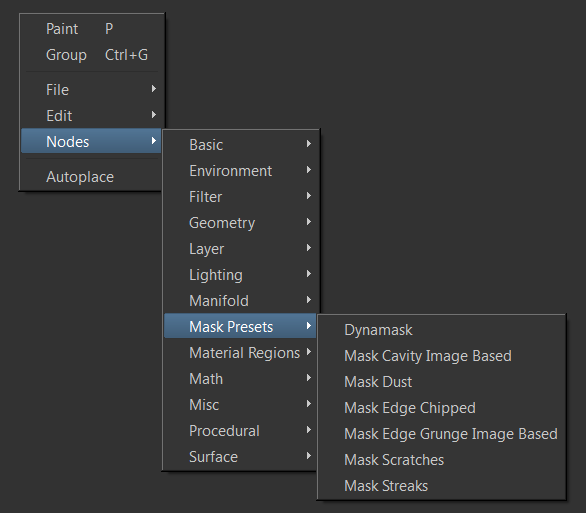 Simply select the Preset Node (Gizmo): Right mouse click / File / Export Nodes. The sample archive shown below, complete with baked maps is available for download as part of your purchase.